Live-aboard yachtsman Julian Mustoe lost everything he owned when his 25ft yacht Harrier of Down sank last week while under coastguard tow. The 82-year-old, who sailed solo around the world between 2001 and 2012, has told PBO of his devastation at losing his home of the past 15 years. He said: ‘I’m very distressed about losing my boat. After 15 years you get very fond of her. For the past three years Julian and Harrier have been based primarily at Plymouth, Ipswich and Lerwick in the Shetland Isles. The single-handed yachtsman was just beginning a new voyage to the Hanseatic ports of the Baltic when disaster struck on the 8 October 2015. 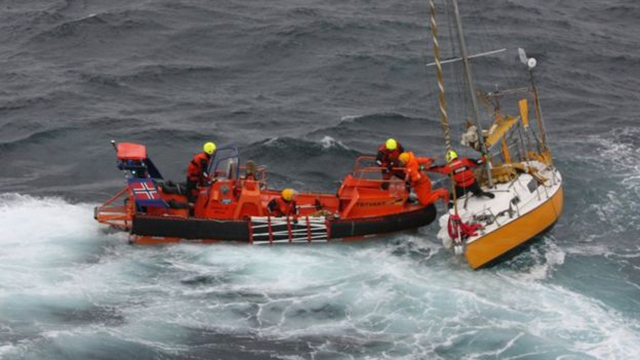 He was rescued by the Norwegian Coastguard after his yacht suffered steering gear failure while he was sailing from the Shetland Islands to Bergen in Norway. 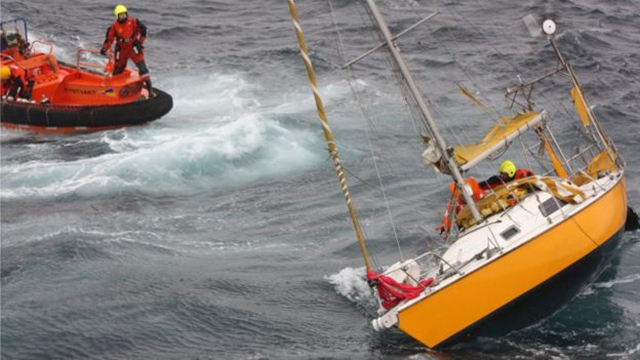 Rescuers began to tow Harrier but his beloved cruiser took on water and sank. The loss of Harrier was not covered by insurance. Julian said: ‘If you’re sailing solo insurers won’t touch you with a barge pole. 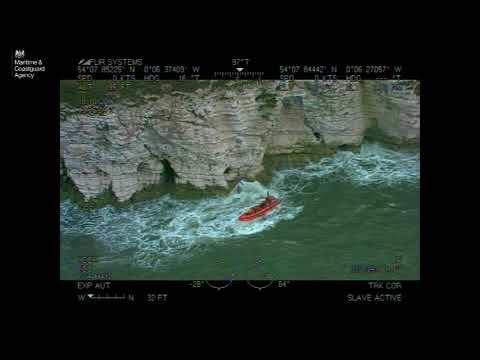 The accident that occurred in the North Sea, the failure of the steering gear and tow could have happened to a fully crewed boat. ‘I was insured against third party but not loss. ‘I sent a lot of money to the bottom of the sea as well as my possessions, including my computer and cameras. 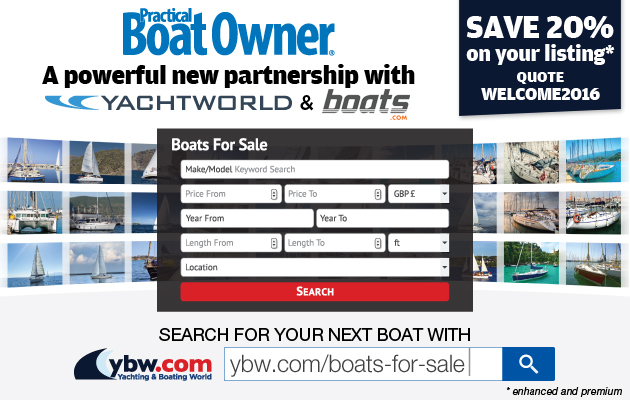 Julian’s friends have created a JustGiving website to raise funds from the yachting community and wider world to help him get back on his feet. Julian’s book, The Voyage of the Harrier, describes his round-the-world voyage which followed the course of Darwin’s Beagle. On the morning of Saturday 3 October 2015 the marine weather forecast was favourable. I was at last free to sail aboard Harrier from the Shetland Islands to Bergen in Norway, 200 miles away. My travelling plan was to spend the summer of 2016 in the Baltic Sea while I visited many of the cities and towns associated with the medieval Hanseatic League. Perhaps another book would emerge. To begin with all went well. During Sunday a sailing breeze from the southwest carried me eastward in good style. Monday brought unexpectedly calm conditions. The sea was tranquil, the sails flapped idly and the autumn sun was warm to the skin. During the following night the wind returned, but not from a favourable direction nor with a comfortable strength. It came in from the east and it soon increased to force 7-8, a near gale. Harrier cannot make progress against such a wind. I hove-to to wait until the forecast wind should return. Harrier lay quietly under a fully reefed mainsail as the three and four metre waves rolled past to the west. At dawn the next day the strong contrary wind continued to blow beneath a heavy grey sky. I could not receive additional radio weather forecasts in the middle of the North Sea. Aboard Harrier I carried a three metre diameter parachute type sea anchor, together with a heavy nylon warp 100 metres long. I therefore deployed the sea anchor and settled down to await a change in the weather. That night life on board was uncomfortable and wet, but not dangerous. The next day, Wednesday, something went wrong with our motion in the seas. I quickly found that the steering gear had failed. The tiller on Harrier is connected to the rudder stock by means of a hefty block of stainless steel, weighing about a kilo. The top of the stock was bolted to the stainless block through a tightly fitting vertical splined hole. The entire stainless steel block had split into two pieces along the line of the rudder stock hole. Harrier’s rudder could not be used, it was now impossible to steer the yacht and no improvised repair was possible. I had to be towed back to harbour. The disintegration of a solid lump of stainless steel was the very last equipment failure that I had anticipated. The failure of the steering gear had nothing to do with the bad weather, and it could have happened just as easily to a large fully crewed yacht as to Harrier and me. Most parts of the North Sea are quite heavily trafficked. I radioed an oil industry patrol ship, the Prospector, and asked them to enquire if the Shetland lifeboat could come out nearly 100 miles and tow me back to Lerwick. The message was taken by the Lerwick coastguard who assumed that my situation was dire, and they proposed to send out a rescue helicopter. Via Prospector I was able to reply that I needed a tow but that I did not need to be rescued from the air. Lerwick responded by asking the Norwegian coastguard service to come out and fetch me. During the night Harrier continued to drift downwind in safety but not under control. On the horizon downwind I could see bright lights of the Alwyn North gas platform. Gas platforms are dangerous places, where highly volatile and inflammable materials are recovered and processed. There was some anxiety aboard Alwyn North that Harrier might collide with them. However, I could see that we would drift near but not onto the platform. In the event we passed about two miles clear and out into unencumbered waters. At dawn on Thursday a Norwegian patrol boat, the KV Bergen, was in sight. She offered to tow me to Norway provided only that I left Harrier and came aboard the ship. I scrambled onto their RIB and was taken to the ship. Harrier was attached by a long warp astern and the tow began, in apparently good order, towards the coast of Norway rather less than 100 miles away. Harrier was floating buoyantly astern and the ship was steaming ahead at a modest five knots. The Norwegian government had sent a modern, fully manned and superbly equipped ship out into the ocean just to bring help to a sole British yachtsman. Once aboard the KV Bergen I realised that I was exhausted and that I was feeling somewhat battered. I got into a bunk and fell into a deep sleep, confident that all would be well. When, in late afternoon, I awoke I was told that Harrier was sinking. What?!! 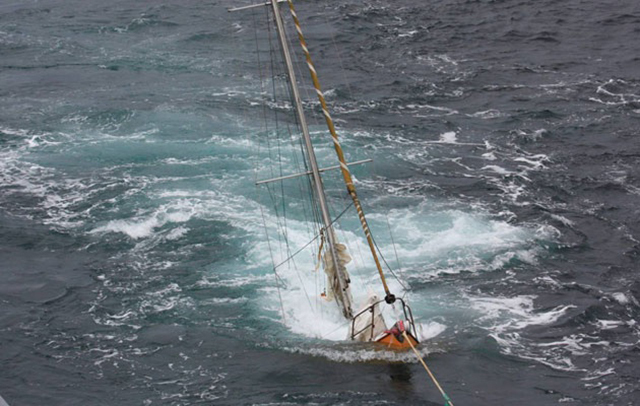 She had been taking on water and was now towing astern in a half-submerged condition. I went to the ship’s bridge from which I could see my lovely little boat struggling for her life. Slowly she sank lower into the water. One last time her bow came up out of the water, as if she were gasping for breath. Then her hull slipped beneath the surface, her mast sank into the water, the tow rope snapped and Harrier disappeared from sight for ever. I felt as if I was watching an old friend drown. I do not know what went wrong. Harrier was a strong boat and she should have towed successfully for hundreds of miles. Did a window fail and admit water? Was she damaged by striking an obstruction in the water? Whatever was the cause she was gone, and with her most of my possessions and much of my small amount of money sank to the bottom of the North Sea. 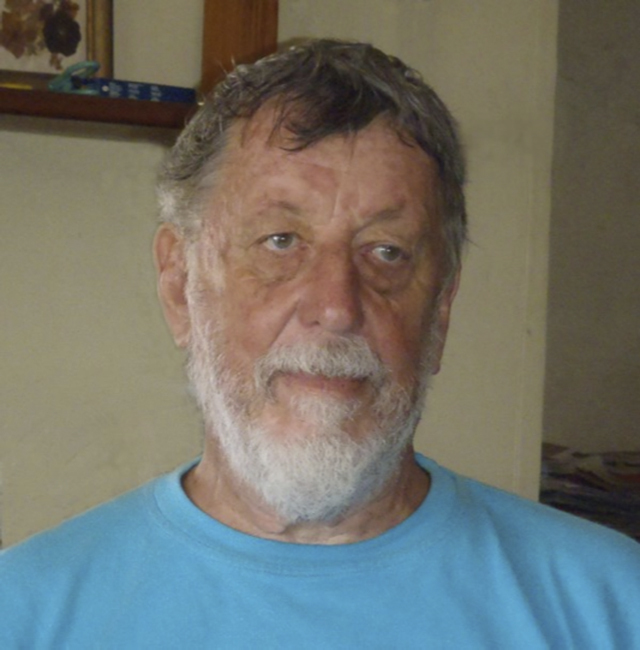 Without Harrier I was homeless, nearly destitute and a shipwrecked sailor. Next day, Friday 9 October, the KV Bergen docked in the city of Bergen. The following day I flew to London and cast myself into the arms of generous friends. Life will not be the same again, but just what the future holds for me I do not know.